Propecia - Buy Propecia (finasteride) to Stop Hair Loss. Propecia is the only prescription medication approved to treat male pattern baldness. The name of the active ingredient in Propecia is Finasteride. The medication works by stopping the production of the hormone dihydratestosterone which causes baldness in men. Clinical studies have demonstrated that Propecia had a beneficial impact on 90% of men who suffer from male pattern baldness in terms of preventing further hairloss or hair regrowth. Propecia is a prescription medication so you must complete a consultation form before you can buy Propecia online. Consultations are entirely free and you are under no obligation to make a purchase. Why Use The Online Clinic for Propecia? As Propecia is a “vanity” medication it is not available on the NHS. 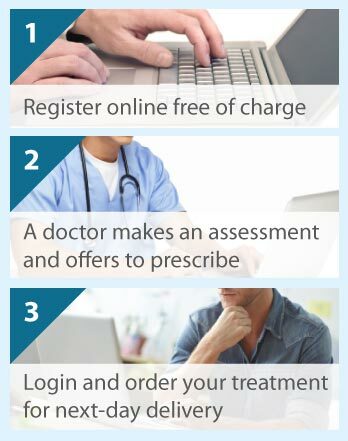 Doctors are usually prepared to prescribe Propecia on private prescription but most men do not have the time to go to see their GP every three months for this medication so find services like those offered by The Online Clinic much more convenient. Propecia is not suitable for everyone but it is generally a well tolerated medication. A majority of men were rated as improved by doctors - 77% against 15% on a placebo. Propecia (finasteride) is a type of medication called a Type II 5 alpha reductase inhibitor and it works by halting the production of dihydratestosterone, which attacks hair follicles on the scalp, causing baldness in men. Interestingly, this hormone appears to promote the growth of hair on other parts of the male body such as in the nostrils, on the chest and on the back. This is the reason why a lot of men grow body hair when they start going bald. Propecia takes around three to six months to have any visible signs of success because of the hair growth cycle. As with all medications, Propecia (finasteride) can have side effects in some men but very few men actually get any side effects and a large proportion of those who do, find that the side effects abate with continued use. The most common side effect is a loss of libido and this affects around 2% of Propecia patients. Erectile dysfunction was noted in around 1% of men during the clinical trials but this was reversed after cessation of treatment in all cases and in some when the patient continued use of the medication. Most men who are going bald are prepared to take the 1-2% risk of these side effects when weighed against the 90% chance of saving his hair! Finasteride use has been associated with depressed mood for some time but a review of evidence in 2017 has suggested that more significant depression can occur, including suicidal thoughts in rare cases. If you are prescribed Finasteride and you develop depression then you must stop taking the medication and report this to us or another healthcare professional straight away. We are not allowed to publish a price list for Propecia or any other prescription drug but we do guarantee to price match any UK website offering an identical service and prescribing genuine medication. We regularly check our prices against those of our competitors and we are confident that you will not find a better offer.